, in Latin Duroeus, was a divine of Scotland, in the seventeenth century, who laboured with great zeal to unite the Lutherans and Calvinists. He was bora educated for the ministry in Scotland. In 1624 he | came to Oxford for the sake of the public library. Hovr long he remained there is uncertain; for his strong inclination for his great work, and his sanguine hopes of success in it, induced him to let his superiors know, that he could employ his talents better by travelling through the world, than if he was confined to the care of one flock. They agreed to his proposals, and permitted him to go from place to place, to negociate an accommodation between the protestant churches. 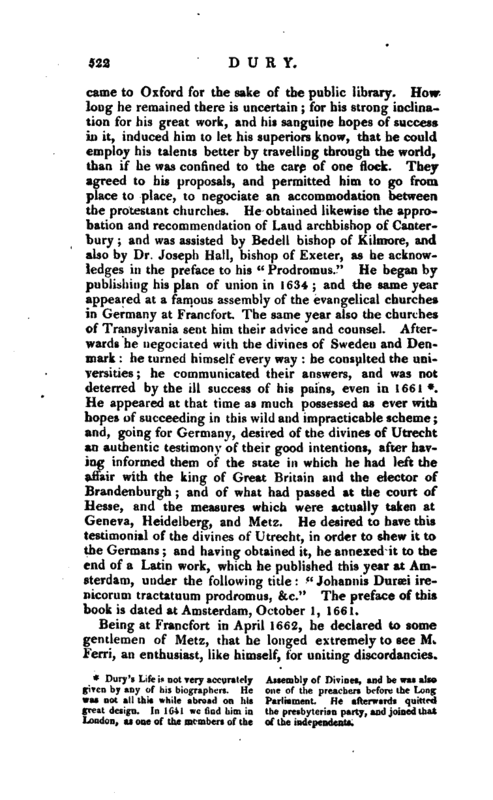 He obtained likewise the approbation and recommendation of Laud archbishop of Canterbury; and was assisted by Bedell bishop of Kilmore, and also by Dr. Joseph Hall, bishop of Exeter, as he acknowledges in the preface to his “Prodromus.” He began by publishing his plan of union in 1634; and the same year appeared at a famous assembly of the evangelical churches in Germany at Francfort. The same year also the churches of Transylvania sent him their advice and counsel. Afterwards he negociated with the divines of Sweden and Denmark: he turned himself every way: he consulted the universities; he communicated their answers, and was not deterred by the ill success of his pains, even in 1661 *. 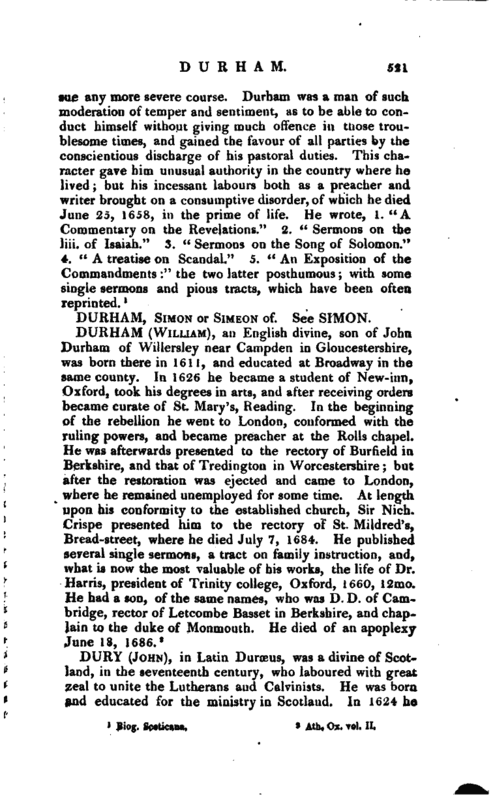 He appeared at that time as much possessed as ever with hopes of succeeding in this wild and impracticable scheme; and, going for Germany, desired of the divines of Utrecht an authentic testimony of their good intentions, after having informed them of the state in which he had left the affair with the king of Great Britain and the elector of Brandenburgh; and of what had passed at the court of Hesse, and the measures which were actually taken at Geneva, Heidelberg, and Metz. 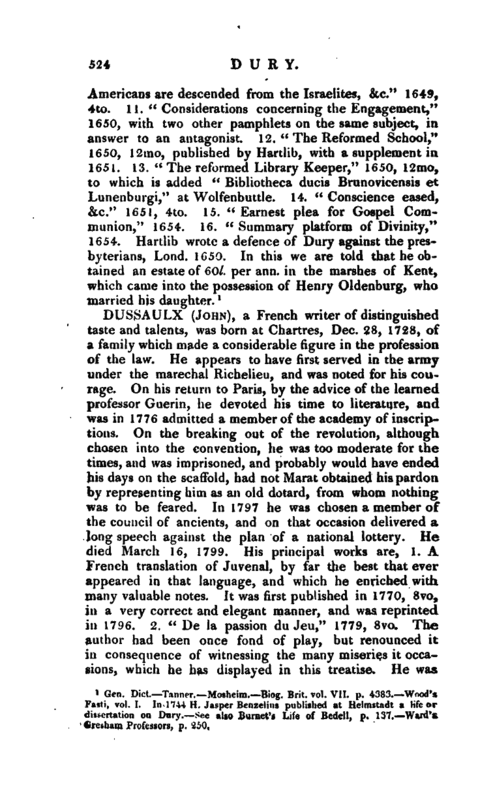 He desired to have this testimonial of the divines of Utrecht, in order to shew it to the Germans; and having obtained it, he annexed it to the end of a Latin work, which he published this year at Amsterdam, under the following title: “Johannis Dursei irenicorum tractatuum prodromus, &c.” The preface of this book is dated at Amsterdam, October 1, 1661. Being at Francfort in April 1662, he declared to some gentlemen of Metz, that he longed extremely to see M. Ferri, an enthusiast, like himself, for uniting discordancies. 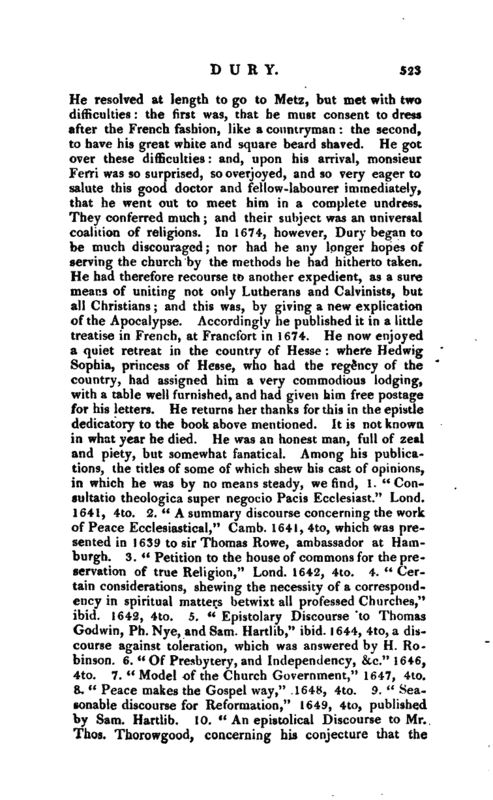 Dury’s Life is not very accurately given by any of his biographers. He was not all this while abroad on his great design. In 1641 we find him in London, as one of the mwmbers of the Assembly of Divines, and he was also one of the preachers before the Long Parliament. He afterwards quitted the presbyterion party, and joined that of the independents.